In 1995 Mr. Gibson was appointed as an antitrust counsel for the House Judiciary Committee under Chairman Henry Hyde of Illinois. From there, he rose to chief antitrust counsel for the committee. In 2002 he became a deputy assistant attorney general representing the legislative interests of the Department of Justice. In 2003, he returned to the House Judiciary Committee as its chief legislative counsel and parliamentarian under Chairman Jim Sensenbrenner of Wisconsin. After two years there, he became chief of staff to Representative Lamar Smith of Texas. After the 2006 election, he became chief minority counsel of the committee. He has now returned to the private sector where he lobbies on antitrust, intellectual property, and other business issues. Prior to establishing his own firm, The Gibson Group, he practiced with the law firm of Constantine Cannon LLC. He and his wife, Heath, live in Washington and New York with their daughter. The views expressed in Persuading Congress are entirely his own and do not necessarily represent those of any other person or group. Have a suggestion for Persuading Congress? 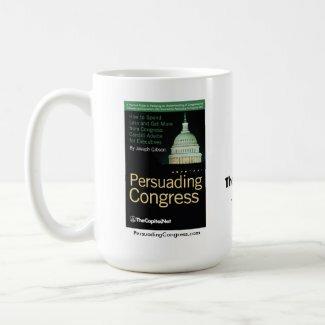 If you have a suggestion for a change or addition to a future edition of Persuading Congress, please contact us or complete our online suggestion form. Find Persuading Congress in a library near you. "The Constitution gives Americans the right to petition their government for a redress of grievances. And no legislature is more accessible to its own people than the United States Congress. But rights and access alone do not translate into effective engagement or useful political action. 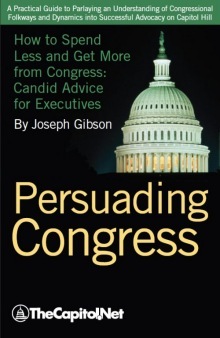 In Persuading Congress, Joseph Gibson, a longtime veteran of Capitol Hill, offers masterful counsel to anyone who wants to work well with Congress. In Washington, there are well over 10,000 registered lobbyists. Very few grasp and convey the keys to successful advocacy as well as Gibson does." "Persuading Congress could be a text for a civics class as well as a manual for advocates." 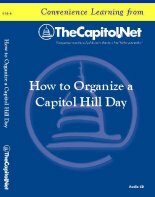 "Joseph Gibson offers keen insight into the process and practical advice for those wishing to interact with Congress. Overall, he has created a straightforward guide about effective interaction with Congress and its members. It is accurate and diplomatic in its approach, a refreshingly candid treatment of a complex and nuanced subject." "I just finished reading your book, Persuading Congress, after completing a stint on the Hill as a [think-tank legislative fellow] earlier this fall. Thank you for such a straightforward, concise and insightful book. I only wish I had come across it before I started my fellowship. Needless to say, I'm recommending it to colleagues. I have no doubt I will continue to turn to your insights as I explore what the next chapter may hold in my career in DC. "